Not sure if you need a high mileage oil in your vehicle? You aren’t alone. If you searched the internet for “high mileage oil,” you would find more than 66 million results. You likely would see advertisements, price options, a few dozen brands to choose from and thousands of forum posts. The problem is that there would be very little information on what makes oil “high mileage,” when it should be used or even what the differences are in the various brands and options. 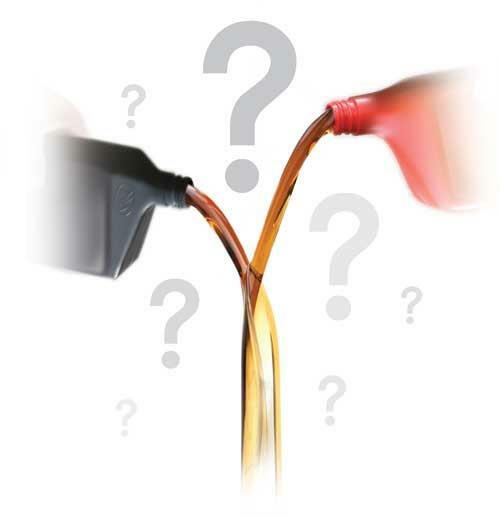 The goal of this article is to answer as many questions about high mileage oil as possible. High mileage oils contain additives and seal enhancers that reduce leaks (both internal and external). It's possible that after an oil change or two, the leaking could stop. This has the potential to reduce oil spots in your driveway and on burning oil in older engines. How do they work? High mileage oils contain seal conditioners and additives that cause o-rings, gaskets and seals to swell. In some cases, older valve-guide seals in engines may have reduced seepage. This can result in lower oil consumption. Many high mileage motor oils include detergents and claim they are are designed to remove sludge from engines. Most high mileage oils are formulated to benefit vehicles with 75,000 miles or more. When to switch is ultimately your decision to make, but you should educate yourself to make the best determination. If you are experiencing blowby, loss of power, cylinder slap, strange noises, etc., you likely are having mechanical failures that should be addressed. These types of issues are not something a high mileage oil will fix. On the other hand, if you have a high mileage vehicle that has been well maintained and are attempting to mitigate more engine wear with realistic expectations, a high mileage engine oil might be the right choice for you. Just don’t think that a high mileage oil will be a “silver bullet” for mechanical wear in your engine. What Is Considered High Mileage? There are no definitive guidelines on what should be considered high mileage. With the technology available today, standard road vehicles can last up to 300,000 miles or even 400,000 miles. It is commonly understood that highway miles are less taxing on an engine than city miles, and research seems to support this. Highway miles have fewer starts and stops. The engine can also reach a steady temperature and operate at peak efficiency for a long period of time. City driving is just the opposite. So, an engine with 80,000 miles may have as much wear as an engine with 150,000 miles. It all depends on how the vehicle has been driven and maintained. Some people might consider switching to a high mileage oil at 200,000 miles, while others may want to change to a high mileage oil at 80,000 miles. For the average driver, anything over 100,000 miles could safely be considered a high mileage vehicle. Since most additive packages appear to be quite similar, it can be difficult to distinguish any real differences between many engine oils. Even with high mileage oils, the additives don’t seem to vary much at all. The concentration of additives most likely is the primary distinction. Motor oil formulations are treated as trade secrets, so obtaining specific additive amounts and quantities can be nearly impossible. Safety data sheets typically only identify a range of additive percentages, and all the additives may not even be included if they are inert. When it comes to the difference between high mileage and “normal” engine oils, marketing plays a big factor, as certain additives on the market come with all sorts of claims. Most of these additives are intended to minimize the asperities on metal surfaces by filling those microscopic valleys and creating smoother mechanical surfaces. Several studies have shown promise with this approach, but more research is still needed to determine the best way to stabilize these nanoparticles in oil suspensions. How Often Should Oil in High Mileage Engines Be Changed? While this appears to be a straightforward question, more than one answer may apply. Depending on what you read or whom you listen to, you might receive conflicting advice. One side of the debate asserts that more frequent oil changes will be needed as an engine’s mileage increases, since the tolerances will not be as tight, allowing blowby and soot ingression. The other side contends that you should be able to extend your engine oil changes because any break-in wear will have already occurred and you won’t need to worry about voiding your warranty. To say that either side is right or wrong would be a fallacy. An engine that has been well cared for, with all the scheduled maintenance performed, should be able to support longer intervals between oil changes. As an engine is broken in, the sharp little edges and rough surfaces become polished down, enabling the surfaces to mate better and lessening the chances of metal-to-metal contact (assuming full-fluid separation at the operating temperature). A caveat to this would be when there is wear in the cylinders and on the rings, which may allow blowby. If you know what you are looking for, a comprehensive oil analysis test slate may not be necessary. A simple blotter spot test may be enough to determine if you have fuel dilution or coolant in your motor oil. 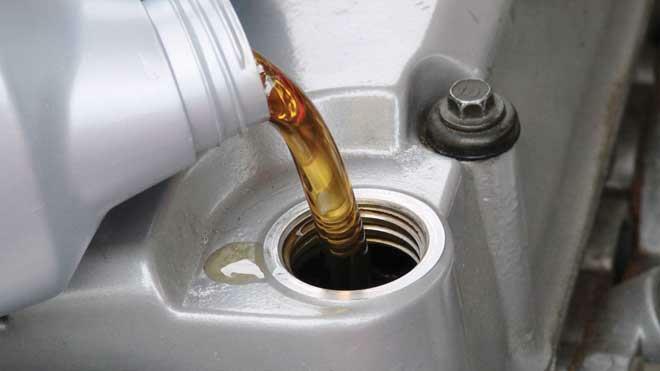 If your engine burns oil or you must add oil to it at regular intervals, you should not try to extend your oil change. If you have performed a compression test on your engine and found that you are losing pressure, you should avoid extended oil change intervals. If you are not using a quality filter, you should not extend your oil change. Reconsider the filter you are using, as it will have the greatest impact on engine life. The better the oil is filtered, the longer the engine and oil will last. If switching from a conventional mineral oil to a synthetic oil, you may have issues with leakage depending on the synthetic used and the types of seals in the engine. This could be caused by seal incompatibility or residue buildup being cleaned out of areas where it was previously sealing a leak. Synthetic oils have advanced over the years, and motor oil manufacturers are taking this into consideration, so this issue is becoming less of a problem. To create a global standard for engine oils, a joint effort was made by the Japan Automobile Manufacturers Association (JAMA) and the American Automobile Manufacturers Association (AAMA), which consisted of representation from DaimlerChrysler Corp., Ford Motor Co. and General Motors. The International Lubricant Standardization and Approval Committee (ILSAC), partnering with the API, ASTM and SAE, developed the Engine Oil Licensing and Certification System. Now, when you look at a bottle of motor oil and see that starburst symbol or the API service symbol (the donut), you know that bottle of oil has been formulated, tested and approved by your vehicle’s manufacturer. As fuel-economy standards change and new technologies and engine metallurgy are introduced, the classifications for engine oils must also change. With this in mind, it is important to read the labels on the oils you buy for your vehicles. The latest API service classification standard for gasoline engines is SN or SN Plus. For four-stroke road vehicles running on diesel engine oil, the most current category is CK-4. For low-sulfur diesel engines manufactured in 2017 or later, you may need an engine oil classified as FA-4. This classification indicates that these oils have been specifically formulated to reduce greenhouse gas (GHG) emissions. These new motor oil classifications are backward compatible, so using a newer category oil on an older vehicle should not create any issues. Yet, what can cause problems is operating a newer vehicle with an older service category engine oil. It is always best to check your owner’s manual and follow the manufacturer’s recommendations for your vehicle. Using a high-mileage oil in a new vehicle would be ill-advised, since no manufacturer recommends this type of oil for a new vehicle. Would it harm your engine? Most likely not, but it would be better to adhere to what is specified in the owner’s manual, at least until the warranty has expired. With the exact formulations inaccessible, it can be helpful to examine the oil manufacturers’ safety data sheets for high mileage oils. The information assembled below is based on data obtained from the SDS for 10W-30 oil from nine of the most popular engine oil manufacturers. Here’s more about the different base oil categories as established by the American Petroleum Institute (API). Group I base stocks contain less than 90 percent saturates and/or greater than 0.03 percent sulfur. They have a viscosity index greater than or equal to 80 and less than 120 using the test methods specified in the table below. Group II base stocks contain greater than or equal to 90 percent saturates and less than or equal to 0.03 percent sulfur. They have a viscosity index greater than or equal to 80 and less than 120 using the test methods specified in the table below. Group III base stocks contain greater than or equal to 90 percent saturates and less than or equal to 0.03 percent sulfur. They have a viscosity index greater than or equal to 120 using the test methods specified in the table below. Group IV base stocks are polyalphaolefins (PAOs). They can be interchanged without more qualification testing as long as the interchange PAO meets the original PAO manufacturer’s specifications for physical and chemical properties. The following key properties must be met in the substituted stock: kinematic viscosity at 100 degrees C, 40 degrees C and -40 degrees C ; viscosity index; NOACK volatility; pour point; and unsaturates. Group V base stocks include all other base stocks not included in Group I, II, III or IV. Note: The most recent version of each of the listed standards must be used. Conventional motor oil begins as crude oil from the ground. It is either solvent refined or hydrotreated and can be classified as Group I or Group II, under the API base oil classifications. This type of mineral base oil carries additives well due to its molecular structure. Yet, it does have a shorter lifespan when compared with synthetic oil and will have a lower viscosity index than a true synthetic or Group III mineral oil. Any motor oil with a base stock consisting of a Group III, IV or V oil would be considered a synthetic oil. Although Group III oils originate from a mineral oil, they undergo such high refining that they hold properties very similar to a true synthetic oil. Synthetic oils generally are more resilient against temperature extremes and sheer than conventional motor oils due to their molecular structure and uniformity. One of the drawbacks of synthetic oils is that although they tend to have higher oxidative stability, they may not hold additives in suspension as well as a less refined oil. A synthetic blend is a combination of oils, such as a Group I or II oil mixed with a Group III, IV or V oil. Conventional and synthetic oils may be mixed so the mineral oil can hold additives in suspension while relying on the synthetic for scrubbing capability and oxidative stability. A review of safety data sheets reveals that a Group II and Group III blend is the most prevalent, with few manufacturers using a Group IV or V oil as the synthetic in the blend. 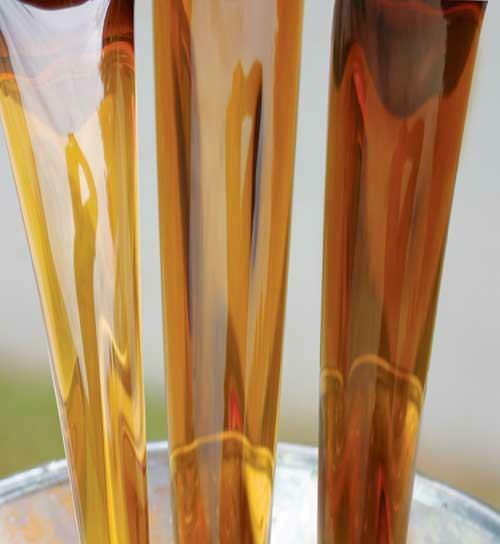 All base oils have properties that manufacturers would like to enhance, suppress or have added to their products. To do this, specific elements are added, such as zinc, ester ash, viscosity index improvers, antioxidants and other additives. Lubricant manufacturers closely guard their proprietary formulations, which makes it difficult to determine exactly how much of certain elements are being used in them. By examining each product’s safety data sheet (SDS), you can get a clearer picture of what is being used and why. With synthetics, it does not matter if your base oil is a Group III mineral oil or a chemically synthesized lubricant, because many additives in the formulation will help the base oil provide proper lubrication, not only in peak operating conditions but at starts and stops as well. Heavy and light paraffinic distillates are lesser known than the API base oil groups. What is important about the distinction is the viscosity, with 20 centistokes (cSt) at 40 degrees C (104 degrees F) being the breaking point. Heavy paraffinic distillates are a complex combination of hydrocarbons obtained from a catalytic dewaxing process. They primarily consist of hydrocarbons, with carbon numbers ranging from C20 through C50, and produce a finished oil with a viscosity of at least 100 Saybolt Universal Seconds (SUS) or 20 cSt at 100 degrees F.
Light paraffinic distillates are obtained by treating a petroleum fraction with hydrogen in the presence of a catalyst. 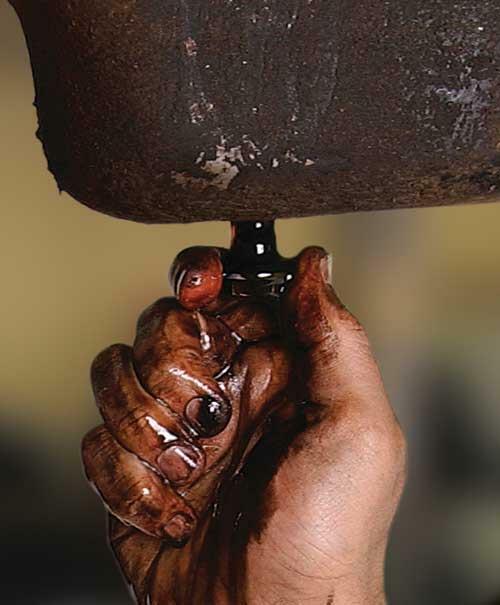 They mainly consist of saturated hydrocarbons, with carbon numbers of C15 through C30, and produce a finished oil with a viscosity of less than 100 SUS (20 cSt) at 100 degrees F.
As is often the case with lubricants, there is no “one size fits all” approach. There likely are some formulation differences between high mileage oils and their traditional counterparts. Is this difference significant enough to warrant the increased price? Many would answer no. Generally, for a vehicle’s engine to last long enough to reach an old age or high mileage, it must be well maintained. The best advice is to continue performing oil changes at the prescribed interval. Do your research on any motor oil you are considering, check which types of seals your engine has and use the best filter you can. After all, your filter will have as much, if not more, of an impact on your engine and oil as the oil itself. Finally, remember that every oil formulation will have its own additive package, with each claiming to be better than the others, but they all have the ultimate goal of providing a lubricant to help ensure a long life for your engine.